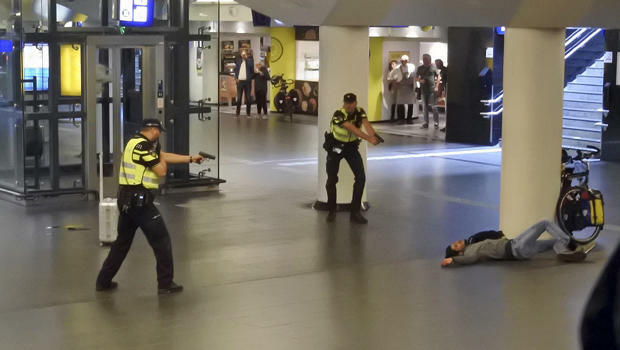 AMSTERDAM — Authorities in Amsterdam say a 19-year-old Afghan citizen who was shot and detained after a double stabbing at the city's main railway station had a "terrorist motive." The Dutch capital's government said in a statement Saturday that investigators reached the conclusion based on the suspect's first statements to police. The suspect allegedly stabbed two American tourists on Friday before police shot and wounded him. He holds a German residency permit and was identified as Jawed S. in line with Dutch privacy rules. The Americans suffered serious but not life-threatening injuries and are recovering in a hospital. Their identities have not been released. Amsterdam City Hall said German authorities searched the suspect's home and seized data storage devices that would be analyzed as part of the investigation. The suspect is to be arraigned Monday at a closed-door hearing. The exact charges he could face have not been released. A dramatic photo captured by a passerby shows two police officers pointing their pistols at a man wearing jeans and sneakers lying on the ground inside a tunnel in the station. Pete Hoekstra, the U.S. Ambassador to the Netherlands, issued a written statement saying embassy officials had been in touch with the victims or their families. "We wish them a speedy recovery and are working closely with the City of Amsterdam to provide assistance to them and their families," Hoekstra said. The stabbings occurred shortly after noon (6 a.m. EDT) on Friday at Central Station in downtown Amsterdam. "Something happened, we don't know yet what, but during that two people were stabbed and one person with a knife in his hand walked away and he was shot by police," police spokesman Rob van der Veen said Friday. Central Station is a busy entry and exit point for visitors to Amsterdam, with regular trains linking it to the city's Schiphol Airport. The station is used by an estimated 250,000 travelers daily, BBC News reports. The station is patrolled by armed police and other security staff.